I've been asked by several people just when these new stamps were available, and what is likely to be the earliest known use. We know for sure that the 6 x 1st (MSIL) with new postcode advert had a philatelic distribution date of 26 January, and dealers may have been supplied a week or two earlier. We prepared one FDC for a customer who wanted the booklet advert and 6 stamps. These stamps could have been used from this time. We know for sure that the Olympic Booklet 2 (MCIL) was issued on 25 February and first day covers were produced by many people. We produced some with all 6 stamps and some with only the Olympic stamps, putting the remainder aside for postage. We used some of these in February and March, though not many as we tend to use special stamps to our customers. I don't know how many were used, nor where they were sent! 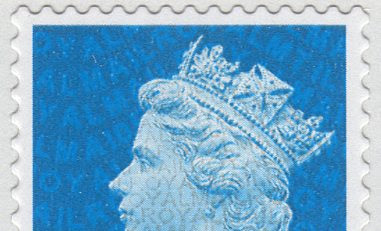 The 12 x 1st and 12 x 2nd (MTIL) booklets were available on the first day of Stampex 24 February, but it is unlikely that any were used postally. As we indicated earlier, the 1st class book was released by Royal Mail to collectors as a visible change with no printers imprint on the back of the book. Oddly in the January Stock List there were two entries for this - UB309 dated 15.12.09 and UB310 dated 26.01.10. This duplication was explained away as an error, and UB310 is missing from the April Stock List. But there are two versions of the booklet! I spent an hour looking through the kiloware - stamps that I had torn off incoming mail since Christmas - and found no MA10 stamps. But two did arrive in the mail this week, so the earliest known dates so far are shown below. Do let me know what you find, so that the record can be updated. MCIL - 11.3.10 - philatelic use for special handstamp. Scan of 2nd class from book of 12 to demonstrate how easy the codes are to see. The security layer on the 1st class gold stamps is also much easier to see on these recent printings than on some of the 2009 printings where deciphering the code was almost impossible.